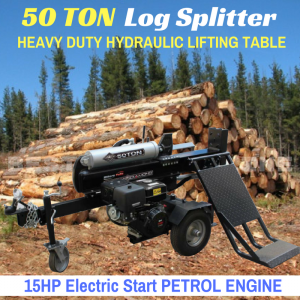 Powered by 4 stroke 13 HP Electric Start engine, this 40 Ton Log Splitter will easily out-split any log splitters in the market and be tough enough to handle many types and sizes of logs. 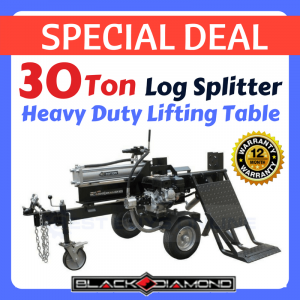 In Australia, we have offered the biggest range of BLACK DIAMOND Log Splitters that have been around for over 20 years, with thousands of products being sold all over Australia. The Black Diamond Log Splitters have been manufactured with the compact, powerful and innovative features to give the best performance as well as tested to high quality standards specifically for the Australian market. - Designed to operate at both horizontal & vertical positions, this machine is sure to stop your back pain of splitting firewoods. - Another important feature is the AUTO RETURN CONTROL VALVE that automatically retracts when you remove your hand from the lever so that you can load the next log with minimal effort and time. - Also, it comes with the Heavy Duty Log Table that allows more working room and storage for multiple timbers. No need to lift those big logs up onto the wood splitter. You can keep them on the log table and split again. - The impressive 8" (200mm) hardened steel splitting wedge and an oversized commercial grade will slice through the toughest of timber (while most of the other log splitters features 150-180mm height wedge only). With a 2-stage gear pump and HEAVY DUTY 5” (12.7cm) x 19.4” (49.3cm) Cylinder ram, the machine quickly builds up to 40 tons of log splitting pressure and can split all types of wood with ease. It can split wood up to a massive 550mm Length, 12” (300mm) Diameter. 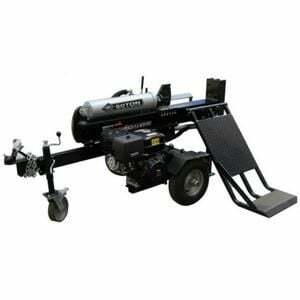 One of the greatest benefits of this product is its 13HP engine petrol powered operation. With the large 16 inch pneumatic tyres and quick release jockey wheel, you can take it wherever you need to on your property easily. Last but not least, the 40 ton SUPER-DUPER PERFORMANCE has been one of the top choices in Australian market for years thanks to its durability and safety functions. The Reinforced Heavy Duty Wedge has been made up of cast steel, wearproof which makes it extremely durable. Last but not least, it has been made with Heavy Duty Construction for maximum strength and durability. 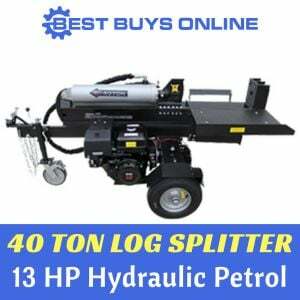 You'll also be pleased to know that 20 litres of Premium Hydraulic Oil is included with this splitter, this could otherwise cost up to an additional $110 from other dealers. 20 litres of Hydraulic fluid. Product Assembly: The LS40 weighs 315kg and is deliver partially assembled in a crate. Please ensure that a suitable lifting unit is available such as a forklift or a crane are available to unload upon delivery otherwise a truck with a hydraulic tailgate will need to be organized at an additional cost. The unit can be assembled for an additional charge for local customers.